Ever find that some people just seem to enjoy exercise more than others? This new study suggests it's not because they're just more motivated but starts in the womb. For some of us, getting into an exercise routine feels impossible and we watch in wonder as friends attack getting fit with ease and enthusiasm. We rationalize the differences saying they have more time to make it work or they just want it more than we do, but a new study suggests that drive to exercise may be ingrained in us from birth. 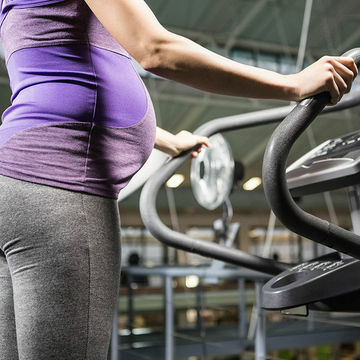 Researchers at Baylor College of Medicine in Texas discovered that mice that voluntarily exercised during pregnancy had babies that were more physically active as adults. During the experiment, scientists studied genetically identical male mice and controlled the amount of physical activity the mother participated in before pregnancy. The researchers noted that the mother mice they chose "enjoyed running" and one was allowed access to a running wheel during gestation, while the other was not. Female mice that enjoyed running were selected and then divided into two groups, with one group was allowed access to running wheels before and during pregnancy, while the other was not. The females continued to run throughout their pregnancy, but scientists noted that as the mice's pregnancies progressed, they moved or walked less than their first trimester. After their babies had been born, the scientists continued to keep watch on the genetically identical mice that were born and their activity level. The results, which were published in The FASEB Journal, found that the mice born to the mothers who had access to exercise here 50 percent more physically active than those whose mothers did not. What the researchers found to be even more important was the mice's increased activity persisted into later adulthood. While the study has only been conducted with mice, researchers say their findings correlate with smaller studies that have shown similar results in humans. "Our study in a mouse model is important because we can take all those effects out of the equation. We studied genetically identical mice and carefully controlled the amount of physical activity of the mothers before pregnancy," said lead author Robert A. Waterland, Ph.D.. He also says their findings are consistent with the belief that exercise during pregnancy influences the brain development of the baby, which tends to make the baby more physically active. "Although most people assume that an individual's tendency to be physically active is determined by genetics, our results clearly show that the environment can play an important role during fetal development," Waterland said.